#2 WBA Lucas Matthysse and #1 Tewa Kiram will be fighting for the vacant WBA World welterweight title next month on January 27 at The Forum in Inglewood, California. 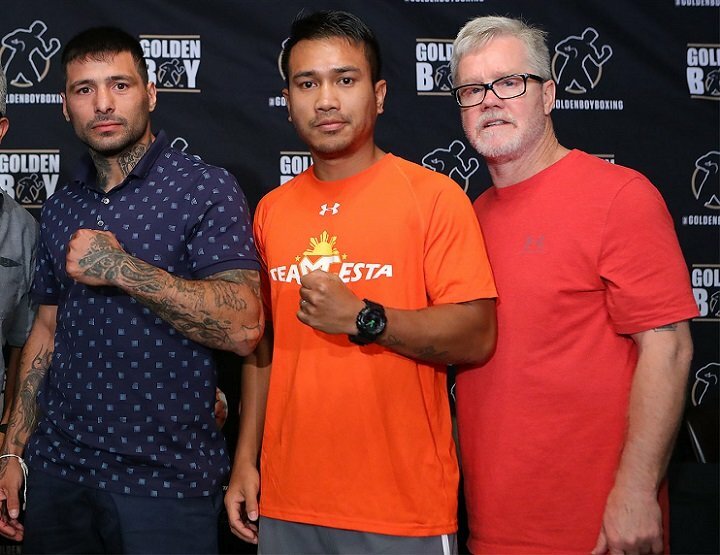 The 35-year-old Matthysse will be moving up in weight to the welterweight division to fight it out with the little known Kiram for the vacant WBA 147lb. title. The World Boxing Association has Kiram (38-0, 28 KOs) rated as their No.1 contender in the division. This is a questionable ranking by the WBA, as there’s not much known about the 25-year-old Kiram. He comes from Thailand, and he seems to have decent power. In the one fight I’ve seen of his, he didn’t look like a devastating puncher. There was power there, but not the kind of power that goes with his 74% KO percentage. The WBA is known for having odd rankings. One example is at heavyweight, they have Fres Oquendo ranked #1 despite the fact that he hasn’t fought since 2014. Kiram looks like a decent fighter, but not the kind of guy that should be ranked No.1. “I’m happy to be back in the United States. I’ve had a great camp. I don’t train for the knockout, but if it comes, I’ll welcome it,” said Matthysse. “I fought everyone at Light-Welterweight. I want to do the same at Welterweight; I want to fight the best,” he added. Matthysse is fighting for the second time at welterweight. He moved up in weight last May and stopped Emmanuel Taylor in the 5th round to win the vacant WBA Inter-Continental and WBO International welterweight titles. Matthysse knocked Taylor down twice in the fight in putting him on the canvas in rounds 3 and 5. That was the first time in Taylor’s pro career that he’s been knocked out. Adiren Broner couldn’t do it. He struggled to beat Taylor in 2014. Matthysse is now trained by Joel Diaz. He’s hoping that he’ll have more success at welterweight than he did at light welterweight. Matthysse was beaten by Danny Garcia, Viktor Postol, Devon Alexander and Zab Judah at 140. “I understand not many people know me in the U.S., but they’re in for a big surprise,” said Kiram. “I’ve never been defeated, and I am fully confident that I will return to Thailand with the WBA Welterweight World Championship around my waist,” said Kiram.